Founded in 2012, Projects of Peace, Inc. was originally established to help various types of local artists jump-start their respected careers. However, that all changed when Hurricane Sandy struck the Rockaway Peninsula and destroyed one of their most beloved landmarks, The Rockaway Whale (aka Whalemina). 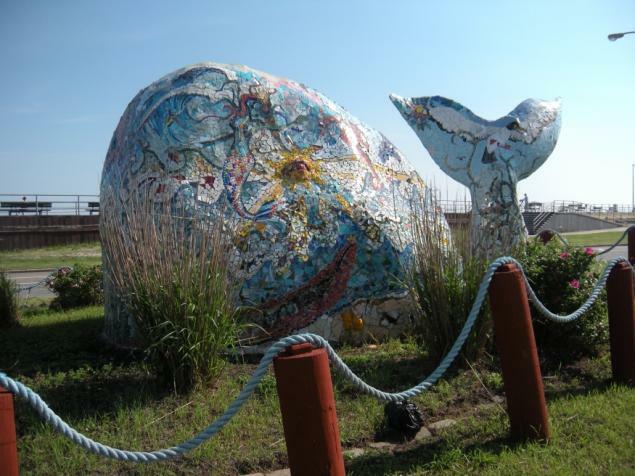 After coming to find out that only its Tail remained intact, Projects of Peace, Inc teamed up with local artist Geoff Rawling and began the process of collaborating on ways to rebuild and restore The Rockaway Whale to its original form. “The Whale Project” now consists of the construction of three whales and an eventual museum-like setting that will emphasize the importance of ocean and wildlife preservation as well as feature the work of local artists and musicians. The first of the whales will be a small display piece that will accompany the organization at various types of events. The second of the whales will be a mobile whale that will be built around the fiberglass hull of a cabin cruiser, and accompany Project Peace, Inc at various events such as the Rockaway St. Patrick’s Day Parade (beginning in 2015) and the Mermaid Parade that is held in Brooklyn each year. The last of the whales (formally known as “Whaleamina”) is their long-term projects, given the fact that it is estimated that its construction will take 3-to-5 years. Additionally, they plan on housing it in a museum-like space that will take approximately 5-to-7 years to construct. Project Peace, Inc’s intention is to engage in a number of fundraising events over in an effort to generate the funds that are needed to undertake a project of this magnitude. WIth that, their first fundraising event will be held on February 15, 2013 at The Irish Circle in Rockaway Beach, NY and feature a number of local bands that range in genre from Classic Rock to Hip-Hop to Rock. Come out and support local artists, and the beloved memory of Whalemina! To make a donation to “The Whale Project”, click here.